Is there a Resource Shortage or a Priority Shortage? When I ask students for their biggest challenges in managing projects, they usually tell me it’s the lack of people, time, or money. They just don’t have enough resources to get done what’s expected of them. I don’t doubt it. The relentless battle cry to reduce waste and increase productivity has many project managers feeling like they are expected to build a bridge over the Mississippi River with one team member and a box of toothpicks. By tomorrow. How much of this challenge is exacerbated by the lack of clear organizational priorities to guide how those precious resources are allocated? Imagine this: Starting tomorrow you and everyone in your organization will be greeted as you arrive with a documented list of organization priorities. You will be able to take this list to your cube, post it on your monitor and let it guide how you spend your time. Presumably, the list won’t change daily, but it will likely change. That’s OK. The important thing is that you have it. Each day, you will be expected to look at your list and if you have something to do on item #1, you work on that. When you finish work on #1 or are no longer able to keep working on #1, you move to #2. When you finish that, you move to #3. If, while working on #3 you are able to resume work on #1, you go back to that. Etc. Imagine if you and everyone around you were working from the same list. How different would your work day be? I worked on a team for a number of years where we did this. We were collocated in a team room and in the upper right corner of the white board in our space, our managing director listed our project priorities. Sometimes it would change, but that was fine. That list was the compass for our collective journey. No one ever had a question about what they should be doing. We all had a sense of how our time and everyone else’s should and was being spent. We finished everything on that list and it was exhilarating. How many organizations actually do this? In my experience, I only need half a hand to count the number of organizations that I know of that have such a list that is published and communicated. I am amazed at how many people really don’t get much top-down, documented organizational guidance in terms of project priorities. Often, project managers, functional managers, and even team members are left to come up with their own interpretation of priorities. Those lists tend to be pretty fluid and change daily or maybe hourly depending on whose bark is the loudest at the moment. This inevitable conflict over resources can contribute significantly to a distorted perception of how scarce the resources really are. It’s worth mentioning here that prioritizing does not mean labeling multiple projects priority #1. Doing so, of course, means that none of them is priority #1. Project owners do this because they fear that a designation of anything other than priority #1 means it won’t get adequate attention or won’t get done. The opposite is true, however. If something is priority #2, 3, or 4, you can be sure it will get done – just as soon as the items before it are finished. On the other hand, if a project is one of several #1 priority projects, it’s anyone’s guess as to when it will get done because multiple people will come up with their own decision about how to prioritize it. Team members, in particular, bear the burden of the resulting conflict over competition for resources. Unfortunately, management is often reticent to come up with the list. There are all sorts of reasons, personal and political, that go into organizational prioritization. People often don’t realize that if all projects are given a unique number on the list, all projects will move through the cue and eventually become priority #1. Everything gets to be priority #1 – just not at the same time. 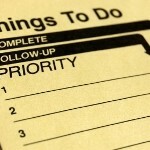 What does your priority list look like? Can you document it and hang it somewhere in your work space? If not, how quickly can your manager help you with that? How about your project team members? Do you know what their priority list looks like? Do they know what their project priorities are? And if all of those lists were collected – from you, your manager, your team members, and their managers – how consistent would they be? How certain would you be about their consistency with senior management’s list? The project manager’s greatest challenge will always be the management of resource constraints. Project managers owe it to themselves, their stakeholders, and their organizations to make sure they are working with clear, shared, and communicated priorities to make the best use of those resources. What an excellent article. Really so simple and clear. How often we make the effort to find the priorities on our own rather than just asking each member what they have as the focus. Very refreshing. Thanks for the feedback, Colleen. Glad you found it worthwhile reading.